It looks peaceful until you consider half the characters on this show work for the other half. Wandering along the water, then having wine and strawberry sponge in the sun is an idyll; carrying tables and chairs (enough for two separate seating areas and a servants’ counter), crystal, china, and tea service, to say nothing of presenting the food in perfect form, is not. Add formal cocktails on the lawn and picnics in the park, and these lazy summer outings make a lot of drudgery for the manor’s ever-shrinking staff. But Downton Abbey isn’t above sweeping hard work under the rug. Mary marries Henry without mentioning her dread of his racing; an episode later, Henry gives it up forever. Barrow slashes his wrists; an episode later, he’s upbeat and outgoing (for Barrow), thanking his rescuers and ready to move on. Daisy’s scorn drives off Andy, then a soft word wins him back. Edith resolves to live as a spinster, but a message from Mary brings Bertie back begging for her hand again. That one gesture quiets the sisters’ lifelong feud. Mrs. Pelham denounces Edith as “damaged goods,” but relents completely after a few hours’ offscreen thought. Master George pleads, “Please don’t go,” and by New Year’s Eve, Barrow’s restored to Downton Abbey—and promoted to butler. Downton Abbey has been one long idyll, a years-long dawdle over claret and cakes on a great estate, reveling in the stately architecture, finery, and mannered gentility of days long gone. Characters gawp over the breakneck pace of change—telephones! gramophones! gentlemen in trade!—but, like Edith’s long-overdue decision to move to London, substantive changes on the show have been as hasty as a glacier. Also like Edith’s decision, and as always on Downton Abbey, much of the planned change is undone at the episode’s end. Dickie Grey’s death sentence lasts just long enough for Isobel to champion him. 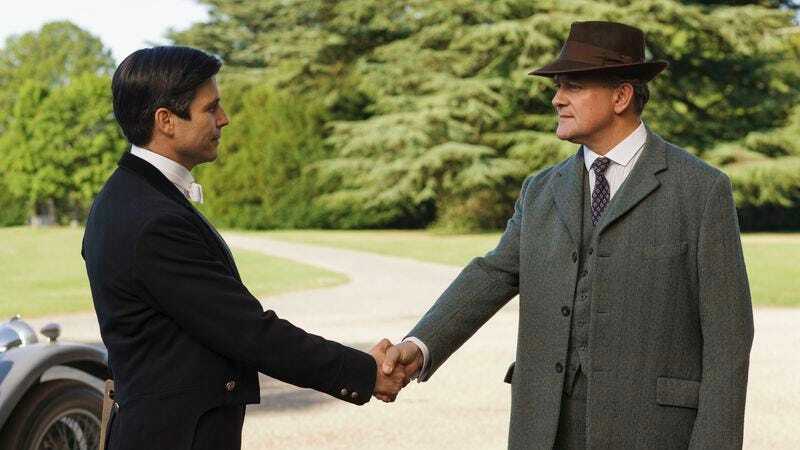 Carson’s portents of doom over his tremors—and I mean doom; with Barrow and Molesley leaving, he remarks that “only Andrew stands between me and Armageddon”—end when Lord Crawley assigns him lifelong tenancy and butler-emeritus status. Barrow is rescued from his pathetic new job and his despair, restored to the manor in a position of high esteem. If it’s doubtful that Robert Crawley would install as butler a man he often wished to dismiss, or that Carson would approve a criminal as his successor (in addition to Barrow’s history as a thief, blackmailer, and black-marketer, the exposure of either his homosexuality or his suicide attempt could bring charges upon Barrow and scandal upon the family he serves), or that Barrow, who’s chafed under Carson’s command, would accept the role of butler without the authority it bestows, Downton Abbey doesn’t fret over those details. As Bates—the often sulky, sometimes sinister Bates who is Downton Abbey’s golden boy—says to Barrow, “I’d rather we part as friends than as enemies.” I don’t have it in me to resent the show’s oversimplification, in part because when it does delve into complications, they’re so well-acted. I had no doubt Edith and Bertie would reconcile before the series’ end, but the combination of shock, empathy, and righteous anger she shows at his ambush at The Ritz does credit to Edith, to Laura Carmichael’s characterization, and to the show. Because Penelope Wilton makes Isobel Crawley such a sympathetic, natural character (and because her recent story lines have been largely supporting), I’ve rarely remarked upon her performance. This scene highlights that naturalism. She absorbs the news silently, her reaction playing quietly over her face. A pursed lip, a tightening of her chin, a rueful shine in her eye—in the hands of this actor, that’s all it takes to show the depths of grief, pain, love, regret, and determination. But this plot is also an example of Downton Abbey preferring melodrama to the demanding task of writing the effects of historical changes into characters’ lives. Isobel, a former nurse and hospital administrator who devours medical news, would know the 1920s brought new hope for the once-fatal diagnosis of pernicious anemia. Instead of a measured conflict in which she campaigns for experimental treatment, Julian Fellowes makes Dickie’s son and daughter-in-law mustache-twirling villains intent on keeping Lord Merton captive while he withers away. Downton Abbey isn’t Mad Men, crafting cultural watershed moments into personal metaphors. It’s more like Dallas with period costume and a veneer of British reserve. And that’s enough when it gives us moments like Lord and Lady Grantham gawking up at the battlements of Brancaster Castle, or Spratt, at first too skittish to sit in Lady Edith’s presence, relaxing into smarmy satisfaction under her praise, or Daisy grinning as she savages her hair with scissors and Anna salvaging it. Downton Abbey also excels at pointed contrasts, like this episode’s cuts between the pomp of the Brancaster banquet and Barrow’s glum routine as Lord and Lady Stiles’ new butler, or the echo between Daisy’s distorted pout into a copper-bottomed pan and her blushing glance in the hand mirror when Andy calls her Clara Bow. Anna’s childbirth scene is a perfectly executed reversal of the roles Mary and her lady’s maid occupied for so long. When the two steal away for a moment during Edith’s New Year’s Eve wedding reception, Anna’s labor begins in Mary’s bedroom. (“Ah. Your waters have broken.”) Lady Mary kneels at her maid’s feet, helping her undress, soothing her, putting her in one of Mary’s own nightgowns so she can give birth in m’lady’s bed. More than all the motorcars or electric hair dryers, the biggest changes in these six seasons of Downton Abbey are personal. It’s fitting that the series ends with Mr. Carson and Mrs. Hughes (their names such a formalized part of their roles that only at home does she become Mrs. Carson) toasting to an unknown future—and for once calling each other Charlie and Elsie. That moment intimacy is a glimpse of hope and love in an uncertain moment. Even at her granddaughter’s wedding, Violet isn’t given to easy sentiment. “With any luck, they’ll be happy enough,” she says to Rosamund, “which is the English version of a happy ending.” But Downton Abbey gives everyone the happiest ending it can, or what Fellowes considers a happy ending. That means nothing revolutionary or edgy, nothing to disrupt tradition: No single-mother magazine editor living the smart life in London, no pert young cook leaving service to seek her fortune. For all its talk of change, Downton Abbey (as Caroline Siede points out, and I agree) has always been more interested in extolling the virtues of the past than portraying its disintegration, much less its injustice. The most transgressive success story of Downton Abbey is Molesley, who started tutoring Daisy “to make sure somebody got away” from the trenches of service. His smarts and diligence are rewarded by the local schoolmaster, who recruits him to teach, as he once hoped to. The cottage he’s awarded suggests future independence from the Crawleys, and with all the happy endings going around (and Baxter’s meaningful “No, we won’t lose touch”), it’s easy to imagine Mr. and Mrs. Molesley, no longer servants but villagers, living together in their own home off the estate. 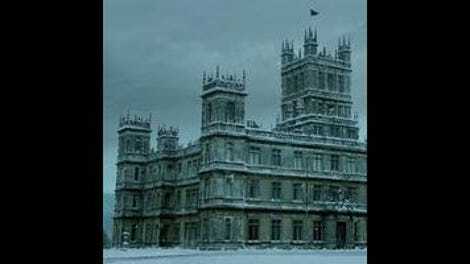 By Lord Grantham’s estimation, the estate is secure. Mary is pregnant with Henry’s child. Robert is hale and healthy. Tom and Henry plan a career outside the estate, to keep them happy and close to home. Anna and John Bates have the baby they had all but given up on. Violet reconciles wholeheartedly with her family. Laura Edmunds catches Edith’s bouquet to Tom’s delight. Mr. Mason flusters Mrs. Patmore with his attention. Rose and Atticus tell of their happy home and beautiful baby. Even Spratt is victorious, with Violet trusting her future sartorial decisions to the wise and witty Cassandra Jones. Downton Abbey may be over, but Downton Abbey will continue as it always has. Though I saw Edith and Bertie together from the first appearance of “poor Mr. Pelham” and I couldn’t imagine the series ending on a sour note, I still held my breath when the vicar recited his request for objections, so who am I to snub a soap opera? Watching this final chapter of Downton Abbey, I laughed and gasped and dissolved into giggles and even wept a bit. It’s a silly show, but it’s lovely to look at, carefully directed, and often very affecting. “I don’t know if you’re a good or a bad thing, Mr. Barrow, but we’ve all been together a long time now,” Mrs. Patmore says, hearing he’s leaving. That’s ungenerous, but I sympathize. Downton Abbey, I’ve loved you for your beauty and your excesses, despite your often careless writing and erasure of honest conflict, for your melodrama and your humor. For good or bad, we’ve been together a long time, and I’ll miss you. I’m grateful the Dowager Countess, that living embodiment of the past, survives the series, especially since the episode opens with mention of Violet abed and exhausted. “How very cheering.” Mary and Henry show more connection and chemistry in the rumpled privacy of their room than in every other scene of them combined. Mrs. Hughes cooing “Give me a kiss!” to Barrow made me tear up. It’s been a privilege to write about Downton Abbey. Thank you for reading.